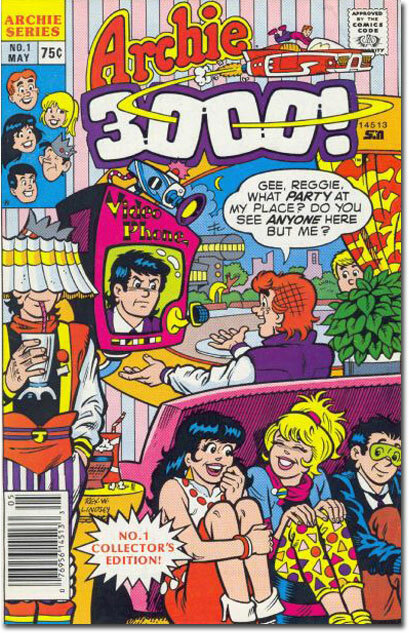 Comic book creators have a reputation for trying to be "hip," "with-it", and "up-to-date" with the "kids," even though for much of the 1960s through 1980 they were written by guys in their forties, fifties, and sixties. Once upon a time in the golden age, young men ruled the comics world, thus ensuring up-to-the-minute topical references like Captain America punching Hitler in March 1941, Sub-Mariner storming the beaches of France in 1943, and Superman destroying Chernobyl in '45. And we all remember Green Lantern/Tommy Dorsey Team-Up, right? But the older these creators got, the weaker their pulse on the youth of America. 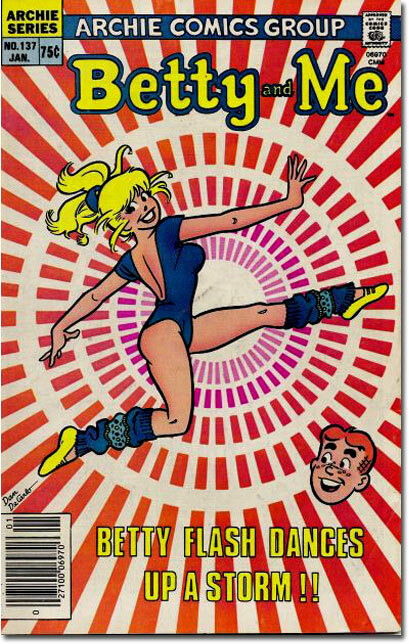 Disco, that stand-by of the 1970s, inspired The Disco Dazzler, whose slightly less topical title premiered in a comic cover-dated March 1981. Break-dancing? Popular for a few years, sure. Not popular by the time Vibe debuted in Justice League of America. Certainly not popular now that Vibe has become a resurrected White Lantern and set for a new series this fall by by Grant Morrison and Frank Quitely. Even tho' Spider-Man and Batman were fighting villains the Hula Hoop and The Polyester Suit in the 1990s, Marvel and DC have since made a more firm attempt to keep their stories less rooted in contemporary references, instead choosing to tie their stories to celebrities and events that will never go out of style, like Stephen Colbert, Tom Cruise's Mission: Impossible, and that time Bob Dole and Al Gore had a fist-fight in the middle of New York that only stopped when Gore realized how many buildings he'd knocked down and burst into tears. 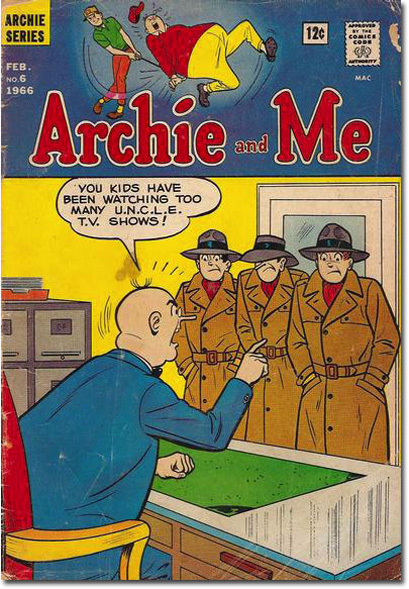 But it's generally perceived that if you're looking for out-of-date, long-past fads, interests, references and pop culture, you only have to look as far on the comic book rack as the section that stocks the approximately one bajillion Archie Comics published every month. 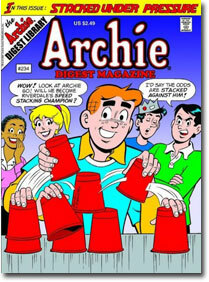 Archie has a solid reputation as the publisher so out of touch with the youth trends of today that they published a story about cup-stacking in 2007...17 years after it became a hit after being performed on The Tonight Show. Not the one with Conan, not the one with Leno. The one with Carson. But is this reputation deserved? 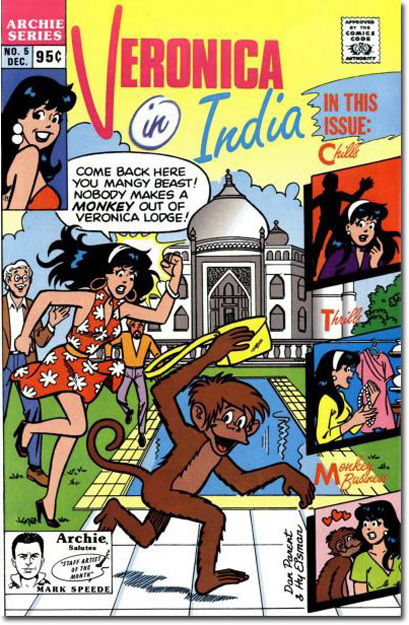 As America's number one publisher of comics featuring fresh, cheery, enthusiastic, perpetually horny yet celibate teenagers, is Archie really that out of touch with contemporary culture? How close are their stories to the actual events that inspired them? Let's find out, shall we? 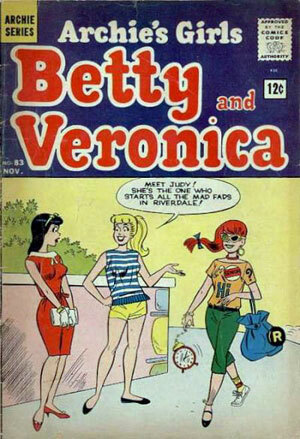 I took a completely random sampling (and you can't prove otherwise) of various Archie Comics to see how up-to-date they were with trends, fashions, and fads. Keep in mind that comics are cover-dated about three months ahead of their availability to the public, and have a writing and lead time of several months before that publication. Also, remember that there may be a time lapse between the debut of a phenomenon and its acceptance as a genuine, honest-to-Furby fad or craze by the American public. So I'd consider any difference of 12 months or fewer pretty good; any of six months or so would be exceptional. 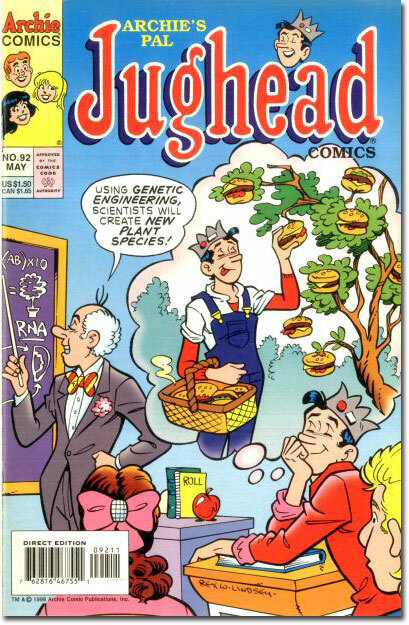 So: Archie Comics: as with it as Veronica's bikinis or as out of date as Jughead's hat? Let's find out! 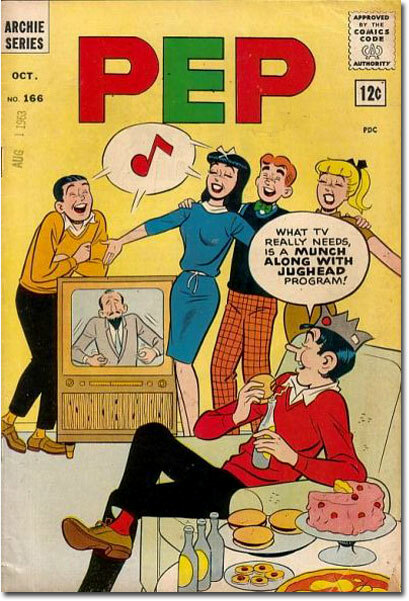 Not to mention: Archie's TV Laugh-Out #1: December 1969. TV series Laugh-in premieres: January 1968. Difference: 23 months. Oh, for cryin' out loud. You forgot one: I saw an issue on the newsstands sometime this year where they were playing Wii on the cover. 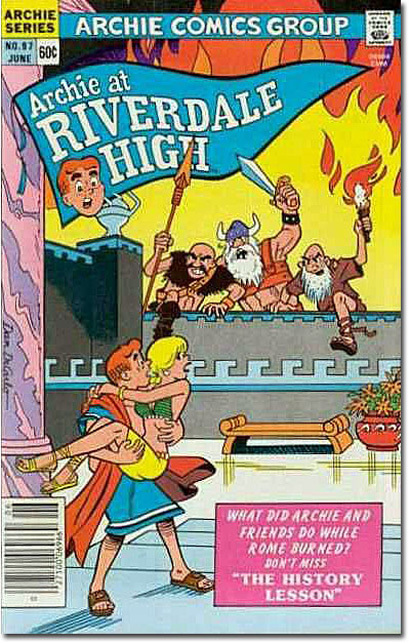 Late to the party as usual, Archie. Hang on, I had a point before I got lost on freakish coincidences. 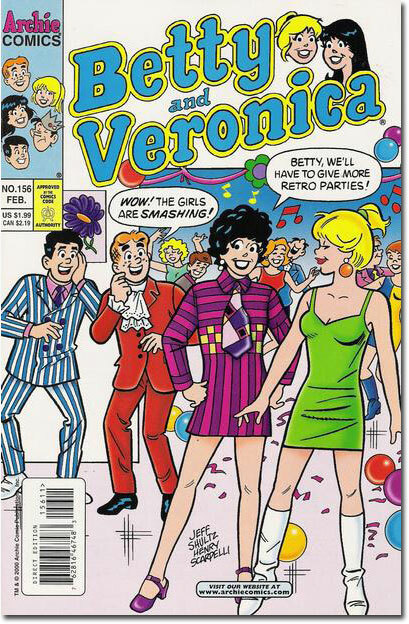 So giving Archie back three months for newsstand cover dating, and one more month for the switch from Julian to Gregorian calendars that Archie cover is only 18883 months out of date. 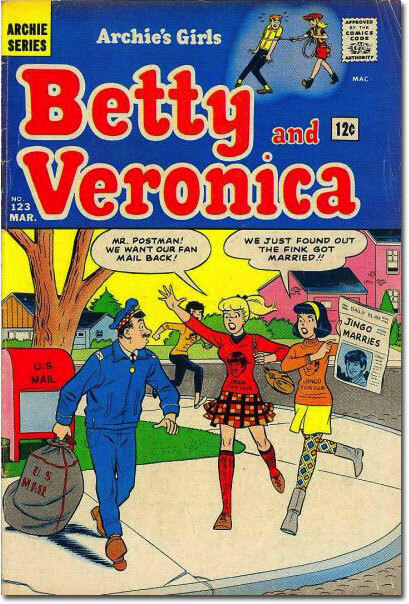 Someone owes the good people at Archie comics an apology. 6-12 months is indeed a pretty good reaction time. 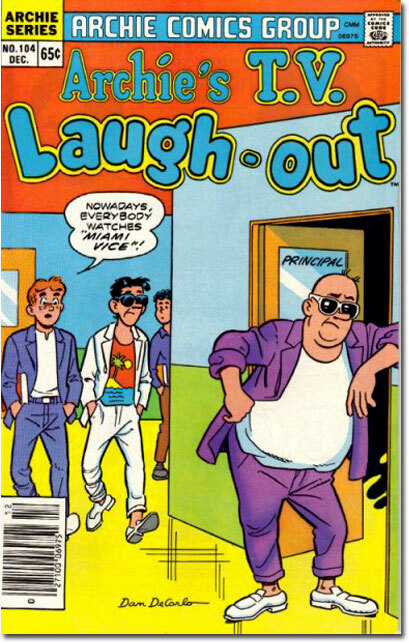 Considering that Marvel and DC feature heroes tied to specific concepts (Night Thrasher, I'm looking at you) or styles (Superboy's original fade haircut, or Earth Man's mutton chops) 5-6 /years/ after the fad has bottomed out, Archie comes out looking like a rose. "and that time Bob Dole and Al Gore had a fist-fight in the middle of New York that only stopped when Gore realized how many buildings he'd knocked down and burst into tears." while the whole post is a work of genius, this caught me by total surprise and made me laugh harder than I have in ages. Well done, Bully. 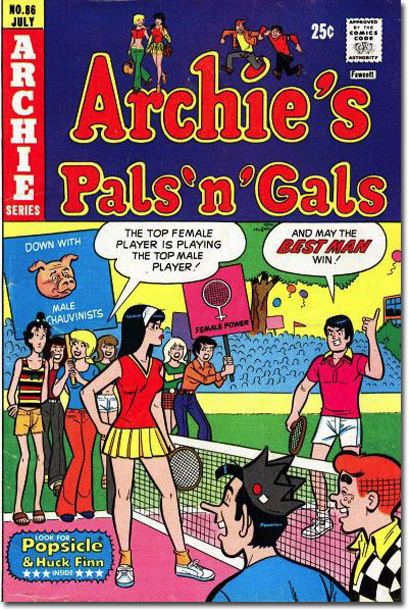 In the mid 80's Archie comics featured a series of strips starring Glenn Scarpelli. This was years after ONE DAY AT A TIME got cancelled and Glenn was not exactly at the top of the pop culture food chain. 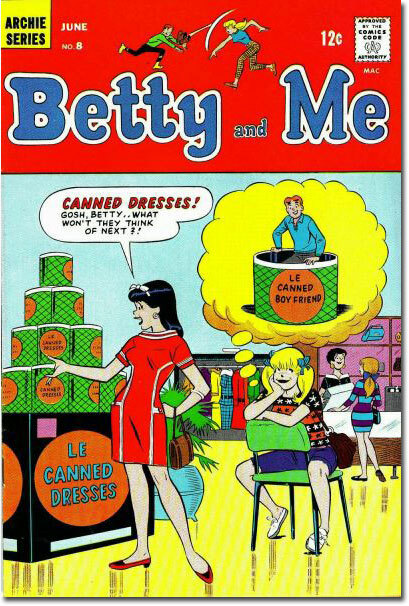 I didn't get it until i nopticed the strips were created by a fellow named Henry Scarpelli. 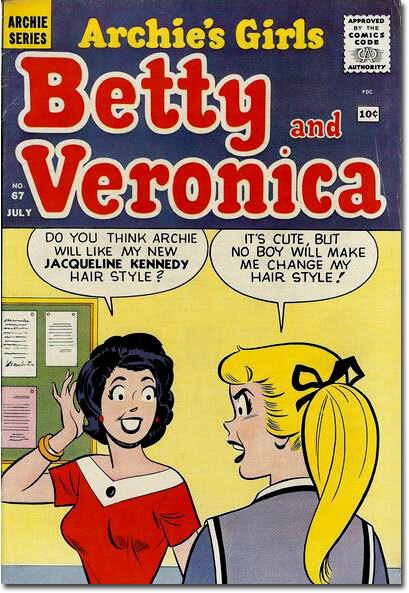 What really dated "Archie 3000" (though they were wise to set it more than one thousand years in the future, compared to those Jetsons and other sci-fi tales which occasionally mention 2005 or whatever) was the hair. Well, it's either dated or a dire prediction of things to come: that in the future, all males will have mullets, apart from the occasional mohawk/unfathomly big hair with faded sides. Also, "The Girl from U.N.C.L.E" launched in September 1966, so it's just *mildly* possible the cover is anticipating the fall season (not the mention of "shows" plural). 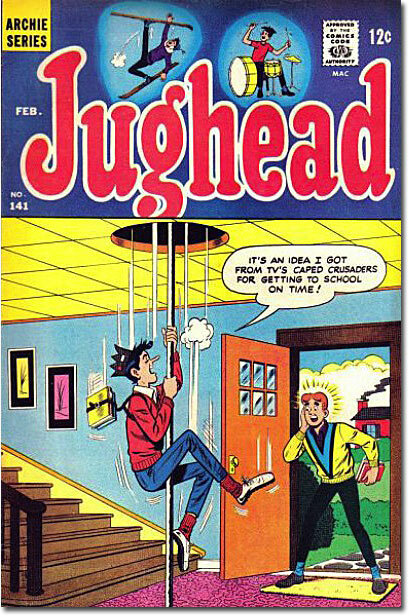 I'm trying to figure out when the first "Man from RIVERDALE" story came out though. I'm surprised too that most of the bandwagon-jumping was actually not too far off. 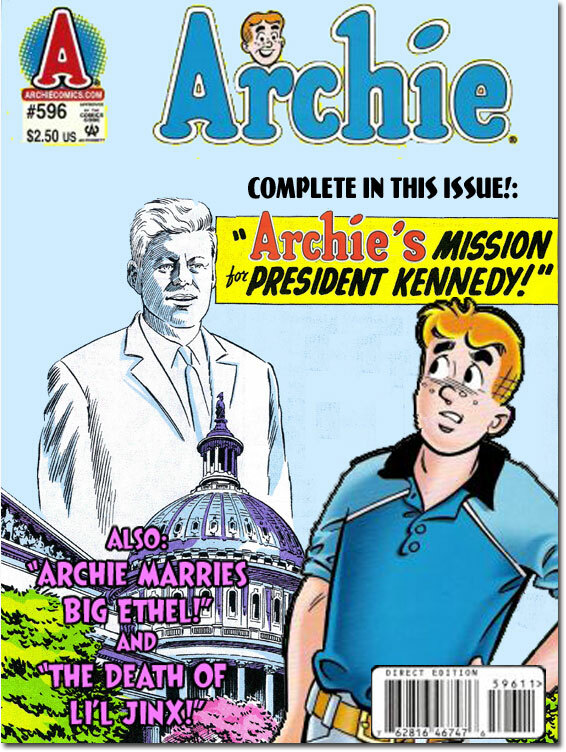 But as you said, Archie itself *beats* any fad in terms of length- they are still recognizable American culture icons over half a century after their creation. How many characters can boast that? 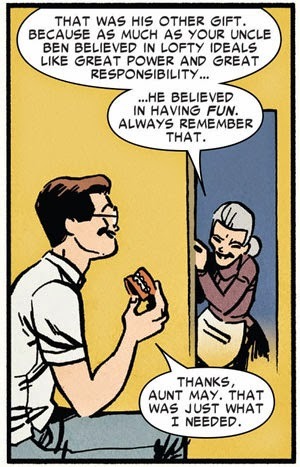 Also, given that Archie lives in a limbo that makes Marvel and DC characters look utterly progressive in comparison, you can't blame the writers from using *ANYTHING* they could to come up with their stories. 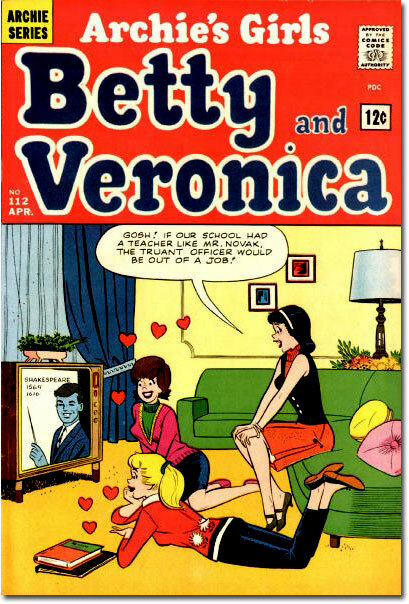 It isn't like the Archie/Betty/Veronica triangle was EVER going to get resolved. 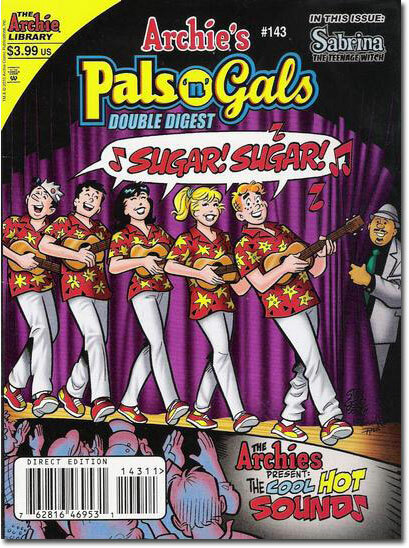 Oh I thought that Jughead cover was an homage to Showgirls circa 1995. What would be equally, if not even more interesting is to find out how quickly after these stories came out did those fads fade? 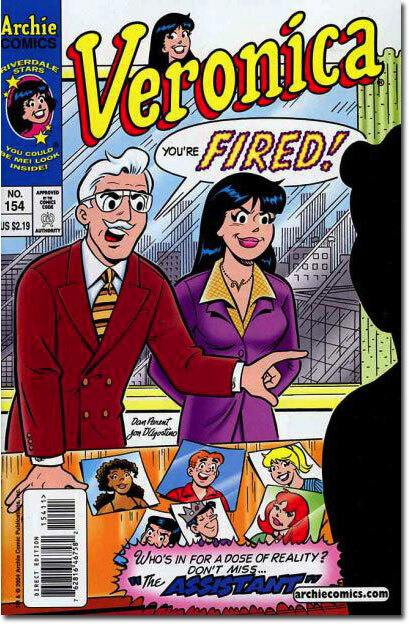 For instance, how much longer was Miami Vice on the air after Archie's T.V. Laugh Out #104 came out? Sunday Morning Silents: Are Crooks Dishonest?